Bowmore Vintner's 27-Year-Old scotch is the final release in Bowmore's exclusive Vintner's trilogy which shows how a wine-cask finish interacts with their smoky, coastal single malt. Meticulously double matured, first for 13 years inex-bourbon barrels, then for 14 years in port pipes this limited edition release has developed a deep mahogany and perfectly balanced liquid with notes of sweet, spice, salt and peat smoke. 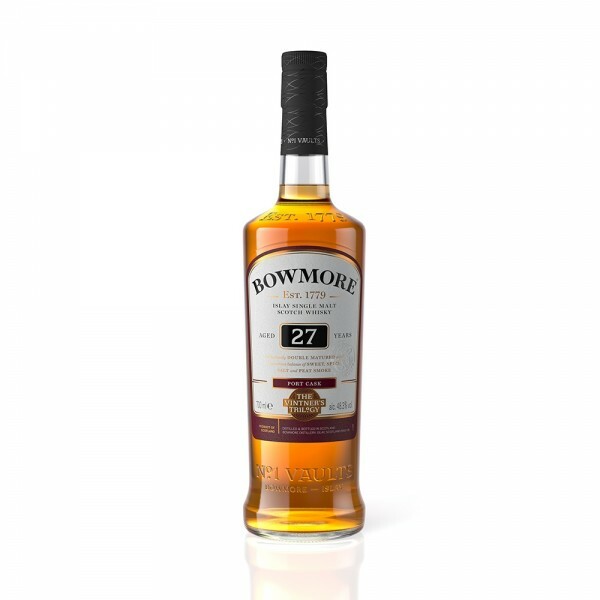 Bowmore's 27-Year-Old is a luxurious balance of sweet, spice, salt and peat smoke from the home of the world’s oldest Scotch maturation warehouse, the legendary No. 1 Vaults.